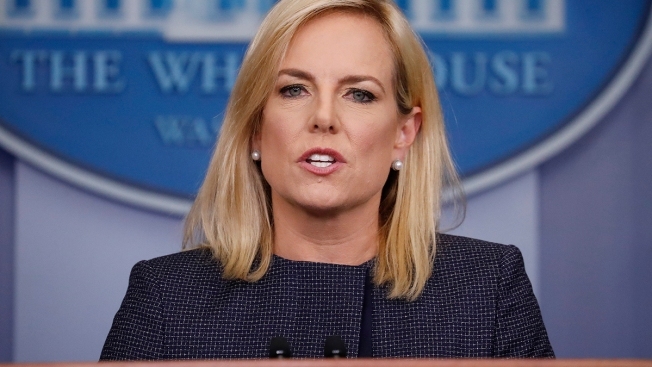 Homeland Security Secretary Kirstjen Nielsen at the White House, June 18, 2018. The Trump administration announced a new rule Thursday that would allow immigrant children with their parents to be held in detention indefinitely, upending a ban on indefinite detention that has been in place for 20 years, NBC News reported. Officials argue that the rulemaking is legal because they will be holding children in ICE facilities that have been evaluated by third parties. And DHS Secretary Kirstjen Nielsen said in a statement that the rulemaking is necessary to enforce immigration laws.